Today I want to talk about a subject which I really enjoy, color theory. Back in my college days, I took quite a few classes on color theory, painting, art history, and obviously design. During my time in school, I always enjoyed painting (usually canvasses, not miniatures) and also enjoyed all the different thins you could do with paint. Lately, there have been a few kickstarter campaigns for different paints which have got me really excited, so excited that I was often nerding out with my friends over the chemical composition of the pigments, their transparency, and so on. In doing this, I realized that most of my friends do not have the same background as I do, and much of what I got excited about went over their heads. Instead of curbing my enthusiasm, I instead took the opportunity to explain why I’m so excited, what chromatic blacks are, the Zorn color pallet, and all kinds of other random tidbits of information about color. It wasn’t before long that they suggested that I write some articles on the subject, and so here we are. Over the next few weeks, I’m going to hopefully teach you all the basics of color theory, why it’s important, and how it relates to painting miniatures. My articles will cover what color is, the how and why of mixing colors. what paint is made of, various color wheels and pallets, and tips to creating good looking color schemes. As I mentioned above, I took a lot of color theory in college. I come from a family with a lot of artists, specifically painters and photographers, so I’ve always had those in my life. When I went to school, I was torn between photography, painting, and engineering, which is how I ended up working as a designer for software companies, sort of an amalgam of all my interests. While I took plenty of painting classes growing up, it wasn’t until college that I was taught color theory as the subject for a class. There was always information related to color theory in my other classes, or learned through experimenting, but actually taking classes dedicated to the matter was something totally new. Fast forward more years than I like to admit, I’ve been painting minis for decades, but never really got experimental with my painting techniques and color mixing… until now! For reasons I’ll get to later, miniature paints are fundamentally different than the traditional acrylic and oil paints I’ve used on canvas. One big difference is that don’t mix as well, at least not how I’m used to, due to the large amount of white added to them. 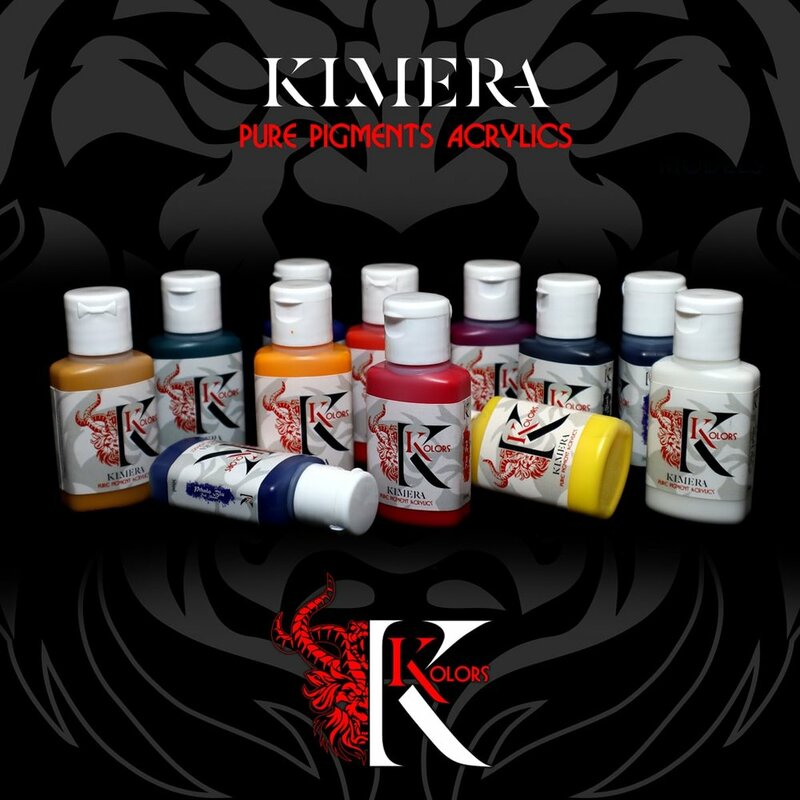 Recently though, Kimera Kolors have come out with a set of paints which behave much more like heavy body acrylics. It’s a very limited palette, 11 colors, plus black and white. That’s all for this week though. Next article I’m going to go over the physics of color!